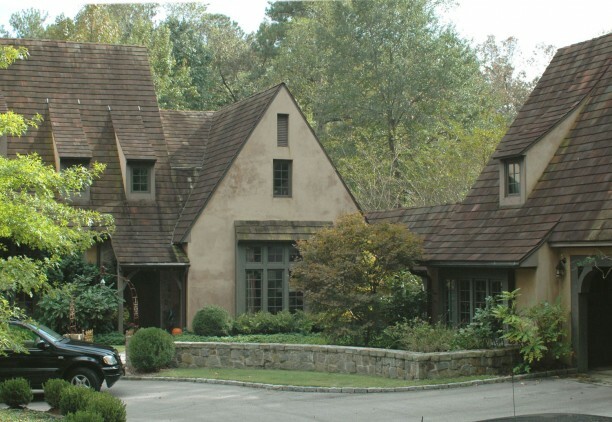 This residence was modeled after the cottage style houses that can be found in rural France and England. The entrance is tucked at the rear of the house facing a garden courtyard and motor court. This gives our client privacy from a busy street and allows them to have their living room and den open to the casual courtyard. The studio building is separated from the main house by a narrow covered walkway with gardens on either side. The reclaimed tile roof blends easily with the earth tone stucco wall and dark wood trim. A casual dining garden is tucked away between the main house and studio building.